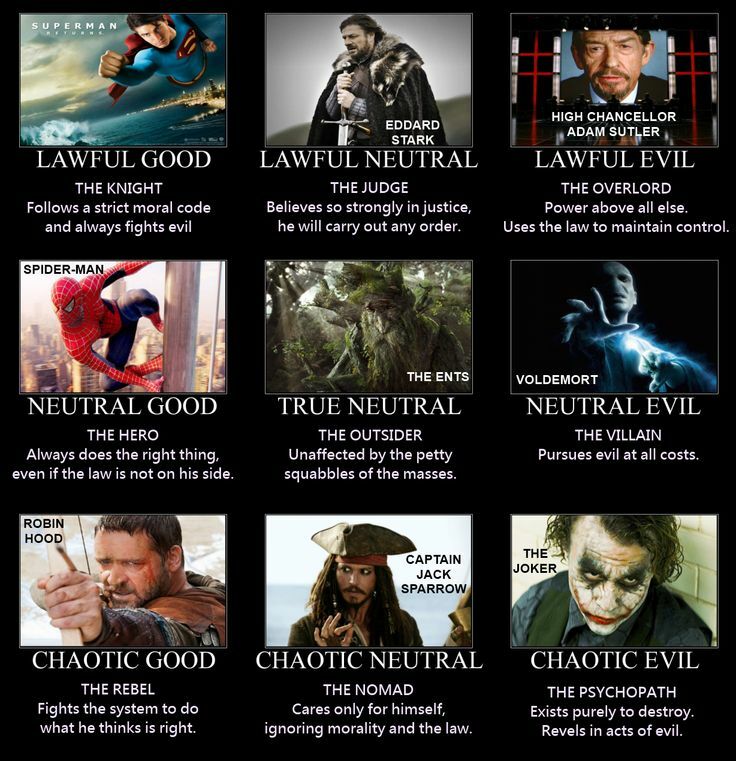 Some of us are familiar with the alignment systems of older D&D/AD&D, where characters are either Lawful, Neutral, or Chaotic, or some combination of one of those three and one of Good, Neutral, or Evil. 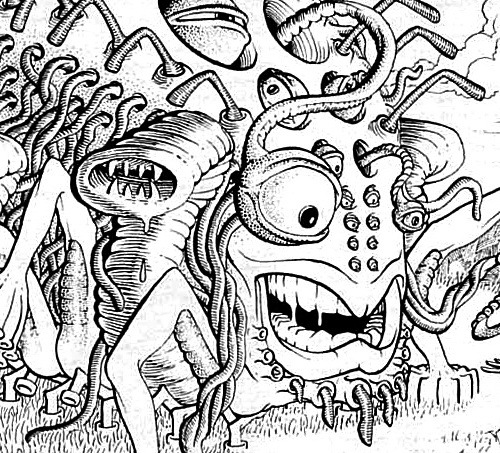 Alignment has been part of D&D since the early days, and probably is related to the wargamer roots of the game, in that the original designers (mainly Gary Gygax) wanted a way of organizing player and nonplayer characters into “teams” of antagonists. As a result, the system has some clunkiness and problems: there’s a ton of discussion about alignment systems, in terms of how they can guide or ruin roleplaying, how or whether they relate to actual ethical systems in real life, or are capable of representing coherent moral systems, whether and how they should or should not link to game mechanics, and whether they make sense at all or should be lopped off the game system entirely. A hypersimplification of classic (A)D&D alignment, but then classic (A)D&D alignment is a hypersimplification, too. Alignment is a character’s orientation on a cosmic scale. It has nothing to do with a character’s allegiances, personality, morality, or actions. Alignments will mostly be used to determine how a character is affected by certain magical elements in the game. The three alignments are Lawful, Neutral, and Chaotic. Lawful characters believe the universe is ordered, that there’s a meaningful destiny (unknown to the characters) built into reality; that “plan” is unreliably knowable through omens, and threatened by unnatural stuff like magic and the (non-divine) supernatural. Chaotic characters believe that magic is an ultimately entropic, inevitable, and ubiquitous force; it’s shadowy and terrifying, but then the universe isn’t ordered, it’s fragile and unsympathetic and probably will end in catastrophe. Clerics must be Lawful. Elves and Magic-Users must be Chaotic. All others are free to choose their alignment. Erol Otus art, depicting reality as seen through a Chaotic character’s eyes. These rules suggest Alignment is really just about characters’ relationship to the supernatural. They don’t do a lot in terms of suggesting character motivations, the way classic alignment does in traditional D&D. 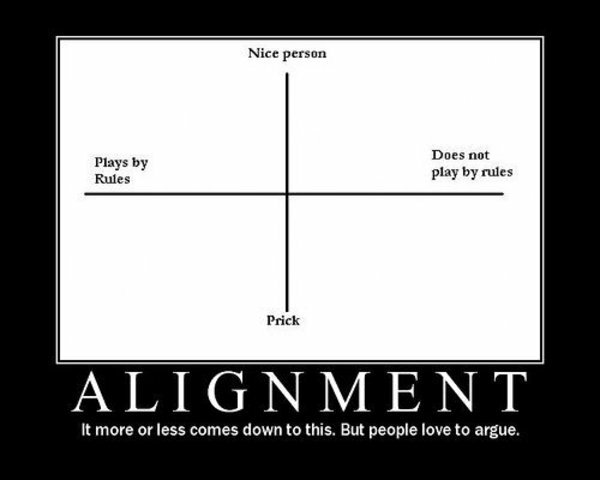 All of that’s fine: I am happy to have alignment get out of the way. I’m also happy for actions to have story consequences: you loot a church, maybe you get hunted down by priests; you go about haphazardly throwing yourself in danger’s way, and you get scarred up. What I think is missing, though, is the creative constraints on character action and roleplaying that alignment creates. The devil with the contract in hand is interesting because his evil is legalistic (i.e. Lawful Evil): he has to get you to sign away your soul, in order to drag you to hell. Personal: To find and rescue her sister’s child, which was kidnapped from his crib by shadowy beings one night a few months ago. Situational: To earn enough money to get ahead of her debts and fund the search for her nephew. Ultimate: To liberate Ireland from English rule and cast the English out violently. Personal motivations create a character arc I can play with as a GM. Situational ones create the impetus for characters to go adventuring instead fo spending all their time pursuing their personal motivations. Finally, ultimate motivations are the kinds of things it’s unlikely a character will achieve in the campaign, but they tell us something about her yearnings and values. The motivations above work well because they’re tied to specific things and people: a missing relative, a colonized nation, and specific debts that need to be paid off… surely to specific debt collectors, and surely to avoid imprisonment in specific debtors’ prisons. 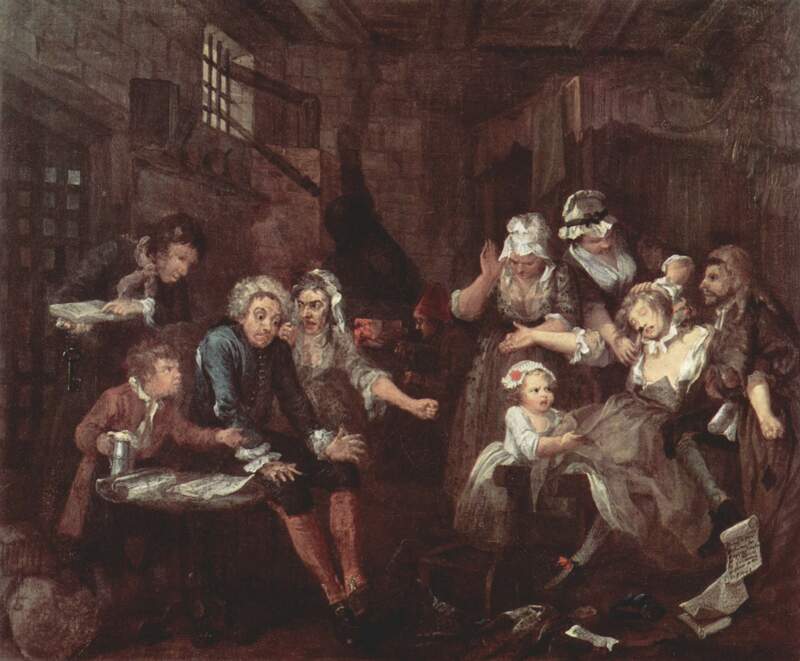 Many’s the adventurer who’s ended her days in debtor’s prison: those situational motivations are important! So if you’re looking for a way to enrich your character, you might try come up with one of each of those motivations for him or her. You needn’t tell other players (though telling the me, the Referee, makes it possible for me to work new threads into the story that reflect these motivations). Anyway, something to think about. We can talk about it next time we play, maybe before or after the game starts. What’s that? You want to know why? Well: Gygax himself claimed Paladins can kill evil orcs without moral qualms. Obviously Orcs can kill Paladins without moral qualms… so what’s the difference? Maybe none: good and evil are subjective, according to the eye of the beholder. But the real problem is that alignment is somehow supposed to map onto the gameworld in a story-objective way: good and evil are absolute forces outside characters’ heads, so they’re not at all subjective. How… premodern. 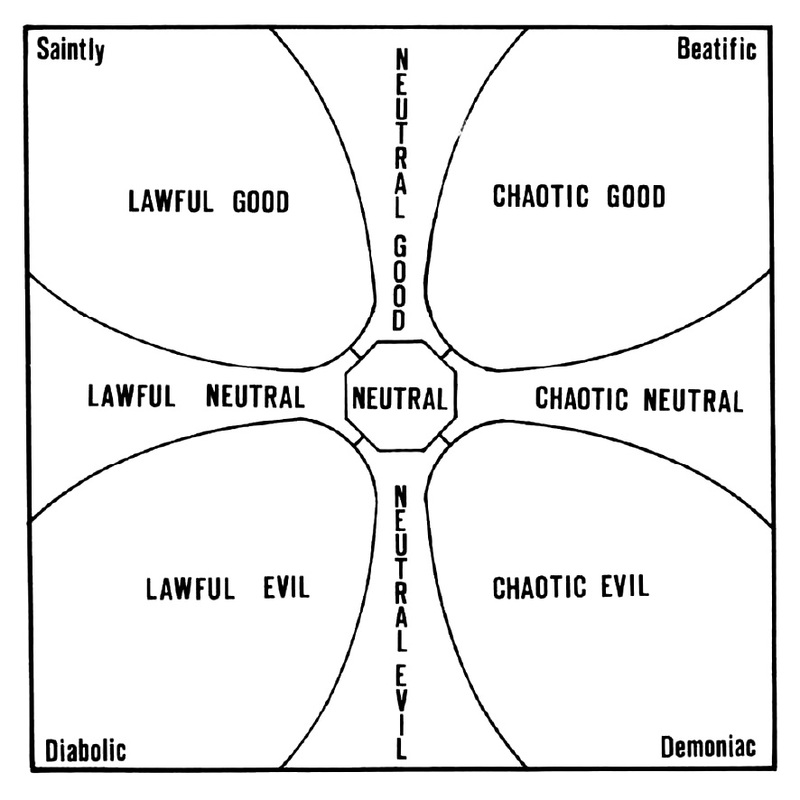 It’s a mess when you get down to it, and likely that’s in part due to the fact Gygax himself was a big Christian who believed in objective morality as a feature of the universe. But I digress.